This bar is our soapy tribute to the sci-fi cult classic movie series, Sharknado. 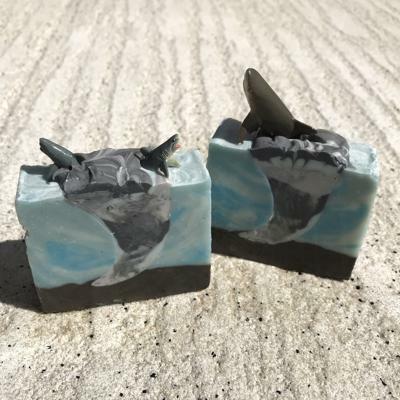 Each lightly scented bar contains a swirling gray tornado with 1-2 shark toys embedded inside. Approx. 4 oz. Ingredients: saponified coconut, palm, olive, canola, castor, and avocado oils; shea butter, mango butter, vitamin e, titanium dioxide (food grade), fragrance, mica.....and sharks!